Imagine the latest music video you saw on MTV. Was the singer looking...spacey? Sure, we've come up with a number of ways to explain this: the stress of the media spotlight, the tiring nature of touring, drugs. But did you ever stop to think that it's not that Britney Spears is cracked out, but that she's an alien kidnapped from the farthest reaches of space? Though that would explain the princess of pop's latest behavior, we're not talking about Miss (Ms.?) 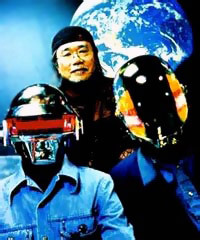 Spears, but rather the collaborative work between anime master Leiji Matsumoto and French techno group Daft Punk, Interstella 5555: The 5tory of the 5ecret 5tar 5ystem. Animefringe has covered this project before, way back in 2001 when Daft Punk announced and then released music videos for their Discovery album. Those videos were of note to anime fans because they were created by Leiji Matsumoto, the creator of such beloved series as Galaxy Express 999 and Captain Harlock. The first video, "One More Time," featured an alien rock band jazzing out and no dialogue. "One More Time" ended on an ominous note when invaders slipped onto the band's planet during their concert. In the second video, "Aerodynamic," the invaders wreaked havoc and kidnapped the band. In "Digital Love" another alien, in love with the band's guitarist, picks up the distress signals from the planet and races to find his beloved kidnapped. Without a second thought, he chases after the kidnappers, who are bound for Earth. Video number four, "Harder, Better, Faster, Stronger" features the "humanization" of the band on Earth. And then, somewhat abruptly, there were no more videos. Obviously there was a continuing story here. We, as an audience, were left with questions. Would the space hero save the band and his love? Why were the aliens being made to look human? Would we ever see the rest of these videos? Thankfully, Matusmoto and Daft Punk have not been sitting on their laurels, as Interstella 5555 not only finishes the story but contains the first four videos in their correct order. Though I loathe giving anything away, the plot has numerous twists and turns. These aren't just music videos made to look nice; there's a plot here - and an exciting one. While a few aspects of the narrative seem a little clichéd in anime - a plot to take over the world , involving the occult and platinum albums - but it's done with such warmth and gusto that I'm sure you, like I, will overlook those little bits. Indeed, it's amazing how well the narrative flows; in a project where both parties could have easily gotten away with adding cute pictures and blinking lights, both aspects of this modern space opera are up to par. While the word "synergy" is often considered rather specious, in reference to Interstella 5555 it definitely applies. The music doesn't take a back seat to Matsumoto's story or visuals, and the visuals themselves aren't just blinking lights. They genuinely feed off of each other to create a film better than its already great parts. There are certainly many aspects to Interstella 5555, both large and small. Throughout the whole, Interstella 5555 seems to be a jab at the American Idol, Morning Musume manufacturing of pop bands. Indeed, the "humanization" of the band in "Harder, Better, Faster, Stronger" speaks to the idea of manufacturing a rock band. Additionally, instead of going the easy route of Matsumoto making a few videos that looked cool in his style, but weren't a cohesive narrative, both Matusmoto and Daft Punk seem to be giving the proverbial middle finger to the MTV culture of loud sounds and blinking lights. On a smaller level, there are some great cameos, including one by Daft Punk themselves. Matsumoto's regulars from his various anime don't make an appearance, but in one scene the alien drums is dressed up unmistakably as the good Captain Harlock himself. The design is classic Matsumoto. 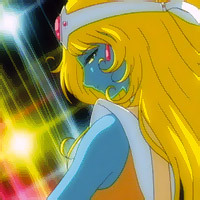 For example, after becoming human, the female alien guitarist definitely recalls characters from Galaxy Express 999. The sharp angular features and the aspects of outer space all make hard to not imagine running into Harlock, the Galaxy Express, or the battleship Yamamoto in the outer reaches of Interstella. Daft Punk is well known for their creative videos, even before Interstella. I remember first hearing about the band on MTV's "120 Minutes" in the early/mid 90s (when it was still possible to catch decent music on the channel, even if one had to stay up until 12 or 1 a.m. on Sunday nights). Even then their videos were creative; "Da Funk" featured a dog-man trying to make it through everyday life, for example. 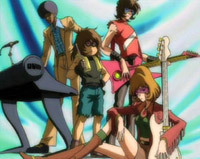 Though I'm amazed by how great Interstella is, I'm certainly not surprised that Daft Punk's involved. 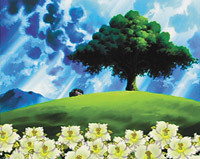 Of course, no discussion of Interstella could gloss over the music. Discovery is an unabashed homage to the funk of the 70s, a fact apparent not only in the music itself but in Matusmoto's stylish designs. Daft Punk, a techno group, has been compared to such acts as the Basement Jaxx, the Chemical Brothers, and fellow French funkers Air, but Daft Punk has an ability to create catchy, futuristic tunes that sound good hawking computer parts (indeed, "Harder, Better, Faster, Stronger" was used in an Intel commercial) but don't pander to the lowest common denominator. The CD (and thus Interstella's soundtrack) is a good mix of action and breathing room. I wouldn't be surprised if Daft Punk arranged the tracks knowing what they were going to do with this project, though Matsumoto definitely knows how to intertwine the music and the action. I can easily say this is good stuff. While Interstella 5555 might not change your views on life, it's a great mix of good music, good art, and good story telling. A combination like that is all too rare these days. So pick up a copy and for an hour you can tell manufactured music to get lost in space.